« Are Reusable Shopping Bags Safe to Use? Celebrate Safely This Fourth of July! Each year on July 4, Americans celebrate our independence with picnics, barbecues, parades, fireworks and family gatherings. Let’s celebrate safely this Fourth of July with the following safety tips. •Perishable foods are limited to 2 hours sitting at room temperature (just one hour if it is over 90 degrees). Keep cold foods on ice. Hot foods can be kept hot on the grill. Refrigerate leftovers promptly and discard any perishable food that has been out too long in the hot temperatures. •	Use a clean platter and grill spatula to take the cooked food off the grill. The juices left on the grill spatula during grilling and the platter used to hold the uncooked meat can spread bacteria to safely cooked food. •	Use a food thermometer to determine if the grilled meat is done. Insert the thermometer into the thickest part of the meat to ensure it has reached a safe minimum internal temperature. o	Poultry should be cooked to 165 degrees F.
o	Hamburgers (ground meats) cooked to 160 degrees F.
o	Fish should be cooked to 145 degrees F.
o	Hot dogs should be cooked to 165 degrees F.
•	Remember to keep your cell phone battery charged. •	It is not worth the risk to end up injured playing with fireworks. •	Enjoy the fireworks display in your community! 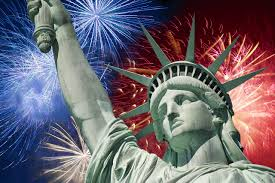 Stay safe and celebrate this 4th of July!